Trip type: Canyoning EM (v3a2). Trampers: MeganS (leader), Bart, Caryl, David, EmilyS, Marie, MikeC, MikeW, Tracey. Canyoning has a narrow season – focused around summer for less time shivering and lower water hazard. This trip was great as a season starter – to get back in to the swing of it and to take a few people out on their first trip – the access is relatively easy and the canyon is not too long or fully committing. My first club canyoning trip used basic alpine rope methods and gear, but the club canyoners have since got in to it more seriously and adopted canyon specific methods. Even with those improvements it is still relatively high hazard and consequence from stuff beyond your control. The starter was a practice evening before the weekend. Outdoors, but without water to try out some canyon abseils and anchor practice. Abseils are not nice anyways so its good to do some test runs before you have to do one through a waterfall. With the final weather check, it was all go Saturday. There was rain moving in but we could get in the canyon before it started and with a small catchment it would likely be okay. The are also two exit points if the flow rose too much. A wet November meant the flow was going to be what it was with soggy hills full of weeks of water to drain. The track in offered some glimpses of the creek which looked good. The group split in the creek, team Toad (or they may have called themselves Fox) leading the way and team Badger following. Although it felt a bit slow, team Badger executed the first section with good technique so in reality good time was made. And we had the odd glimpse of the team ahead. The main waterfall is a bit tricky with the bottom out of view and the abseil through the flow, so we decided to lower to set the rope length. I was keen on this as practice was the major part of the trip. Although I set the rope right for a swim in the pool it was short for a comfortable bottom belay, especially when you are short like I am – learnings for next time. With everyone down it was time to pull the rope. And the rope was stuck! Megan tried a few techniques to get it moving with Mike, but it would not run past much the same point each time. Everyone ran through scenarios. A look at the canyon topo showed we were at the start of the second section – the crux section with at least one other abseil. Megan dashed ahead to see if she could catch team Toad, but they were now out of sight. The rain started to fall in big drops and the clouds made it even darker at the bottom of the waterfall. It was a case of thinking through how are we going to get out? We outlined our options as a group and ate chocolate as the shivering was no doubt taking a toll along with considering our situation. In the end Megan ascended back up a strand through the flow like a pro to see if the rope could be released while I had other end in a meat belay. And it turned out it could. Megan’s rope retrieval skills and experience saved us from losing anything other than time and energy – phew! The next abseil was a treat down a short moss garden out of the flow. Further down I went for a jump from first position and got told off (quite rightly). Another lesson re-learnt – when you get tired and more lazy you still need to think safety first and check pools. A bit more stumbling along following Em and amusing Tracy with my ‘how to fall over’ antics and we were out on the track and then back with team Toad at the road end. 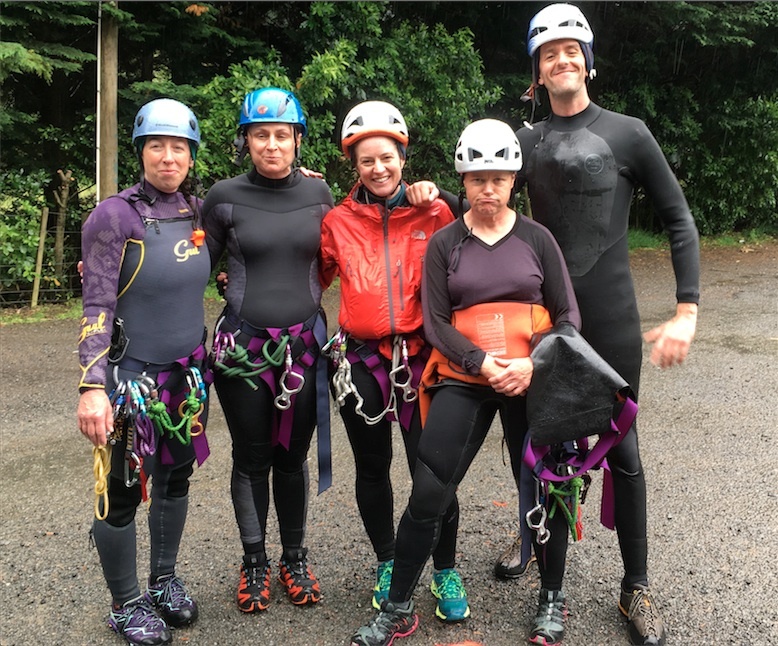 The canyon was a great season starter, with a good combination of elements to give new people a sense of what canyoning is like and to refresh and build skills for those who have been canyoning before. It turned out team Toad had realised something was wrong and were thinking through what they could best do to provide team Badger with help. Badger’s first option worked and allowed us all to complete the canyon with nothing worse than some lost time and a bunch of useful experience based learnings.